I’m not immune to pumpkin fever this time of year. I made a double batch of pumpkin bread last week (why yes, that is 4 loaves) and it was glorious. But you know what else can give you all the happy cinnamon-spicy fall feelings? Apples. 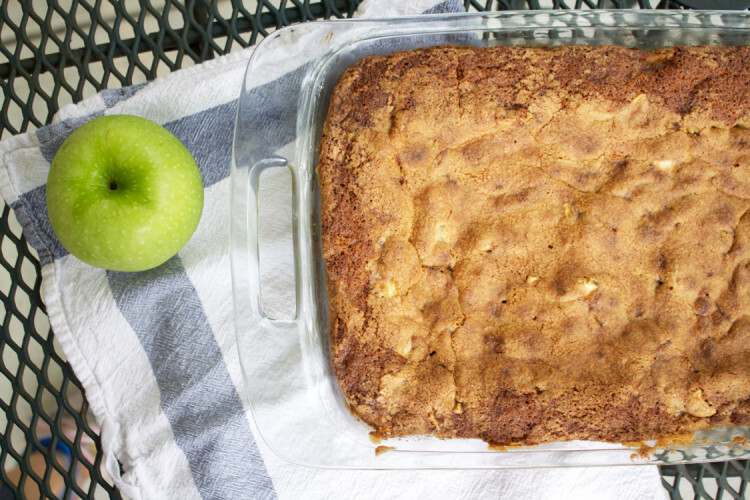 In many forms…applesauce…apple pie dip with cinnamon sugar pita chips…and especially, especially, apple cake. 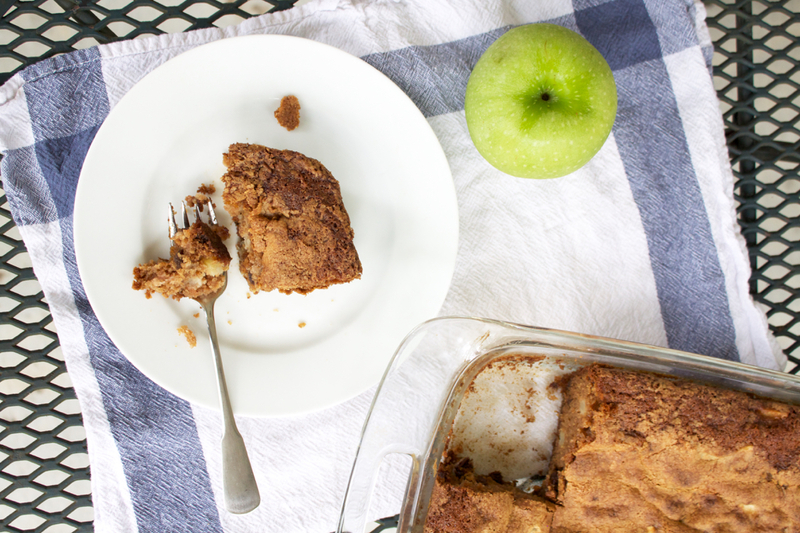 It’s my perfect fall dessert (or, you know, really good breakfast): tart Granny Smith apples and sweet, chewy raisins in a simple moist cake with lotsandlots of cinnamon. I love the batter of this cake because it’s literally mostly apples. Like, you’re doing something SO RIGHT when you have to blend your ingredients in a non-traditional way because of the apple:batter ratio! 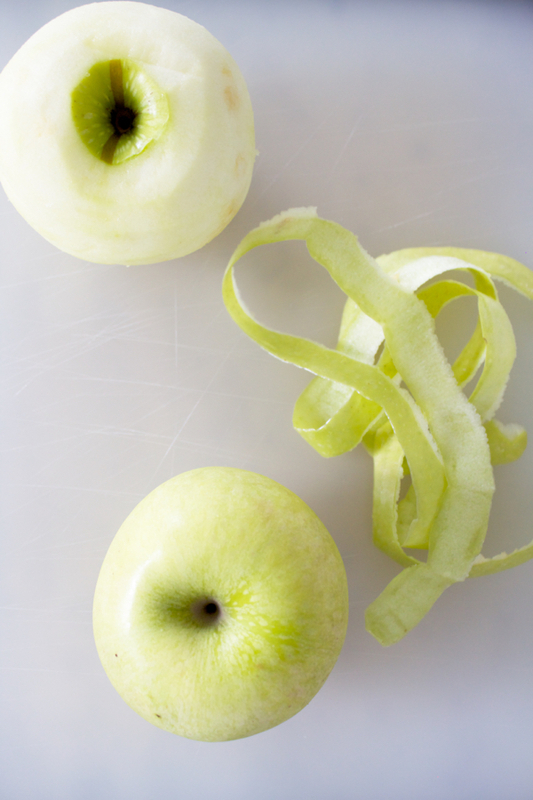 Peel the apples, slice them into quarters, and cut out the core. Cut them into into thin slices, and then chunks. 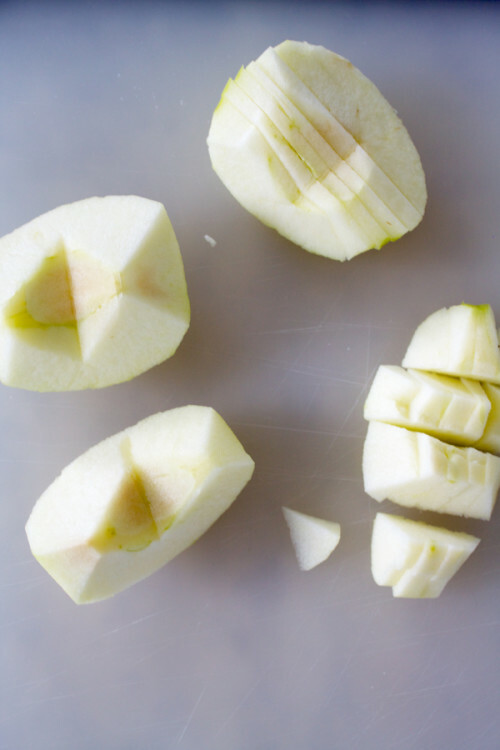 You need 4 cups of chunks, which is about 2 large or 3 medium apples. Make the batter by creaming butter and sugar together until they’re nice and fluffy. 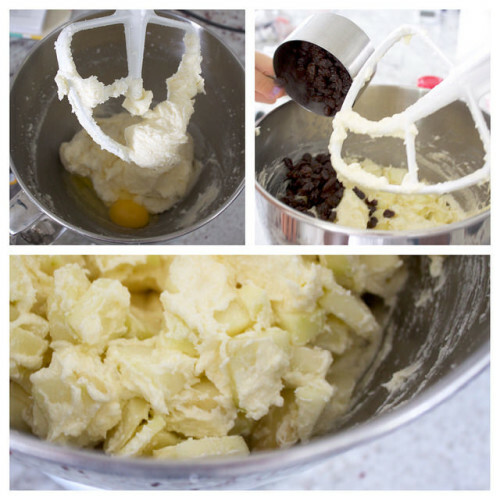 Beat in the eggs and then – this is really important – add the apple chunks and raisins directly to the creamed mixture, before the dry ingredients! This can feel a little counterintuitive, but it’s really important in this recipe. Before I had my stand mixer, I accidentally did it out of order once and it was REALLY hard to “fold” all those apples into the batter once the dry ingredients were mixed in! I forgot to add the apples and raisins together, but you can mix them into the butter/sugar/egg mixture at the same time! Once the apples and raisins are mixed in, you add the dry ingredients. I think the real instructions are to sift them together first, but I just dump them all in without sifting or premixing. Smooth the batter into a greased 9×13 pan and it’s ready to bake! It looks kind of pale and unexciting in the batter stage, but it gets brown and burnished and beautiful in the oven! 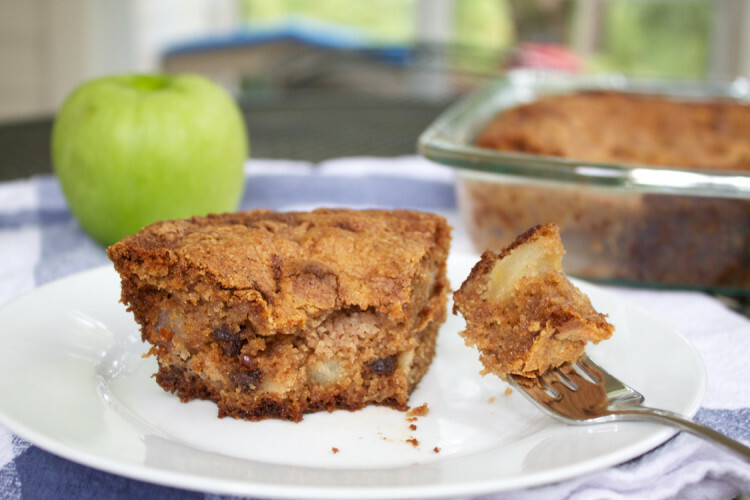 I seriously love the apples-and-cinnamon flavor combination, and the cake has the most incredible tender, dense, moist texture – almost between a cake and a blondie – from the butter and all those apples. It’s a great dessert, but also feels so, so at home on the breakfast table! Preheat oven to 350. Cream together butter and sugar for several minutes until light and fluffy. Add eggs one at a time, beating after each addition. 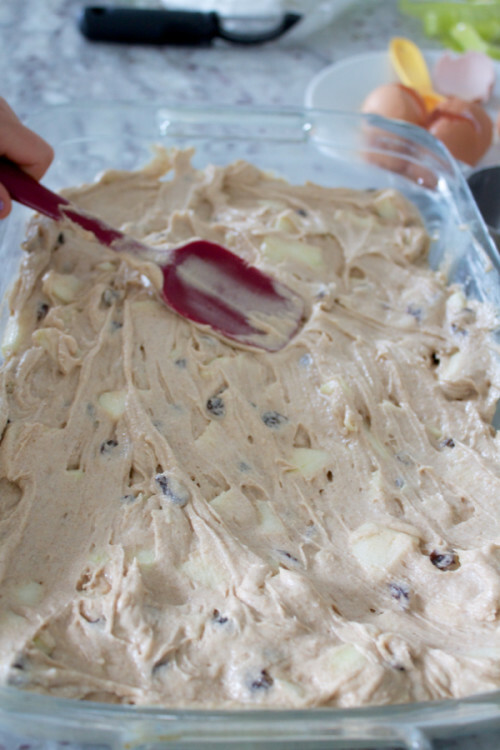 Add apples and raisins to creamed mixture and mix until they are coated with batter. Add dry ingredients (pre-mixing them is recommended, but I don’t actually do this) and mix until just combined. Smooth batter into a greased 9×13 pan. Bake at 350 for 35-45 minutes, or until cake is browned and a toothpick inserted into the middle comes out with moist crumbs. I thought about fancifying things with a glaze for the blog, but I really love the cake as is. If you want to go that direction, I was leaning toward trying this Brown Butter Maple Glaze. I’m making this as soon as I get home! I’m thinking this could be made even more dangerous with vanilla ice cream and caramel sauce. Yummmm. Thanks for sharing this. I’m looking for recipes to use up all of these mountain apples. As Bet’s mom I was pretty sad that I was out of town when she made this apple cake that we all love, and so I didn’t get to have any. BUT now as mom of commenter Laurie, I’m super excited because she’s planning to make this when she gets home, and that’s where I am! Woot woot! Plus I’ve been taking care of her three kids for a week while she’s been out of town and I DESERVE SOME APPLE CAKE! Probably for breakfast, lunch, and dinner. And snacks. Oh man. I have leftover homemade salted caramel sauce staring me down and begging to be poured over this cake! Sans raisins though. I just can’t do ’em. Love that you compared the cake to blondies, it’s what sold me! DO IT. And then send me some. That sounds a-mazing! This is currently in the oven! Thank you! Hope you guys enjoyed it, Rachel!